Note: This guide is on both chisel hammers and warrington hammers. 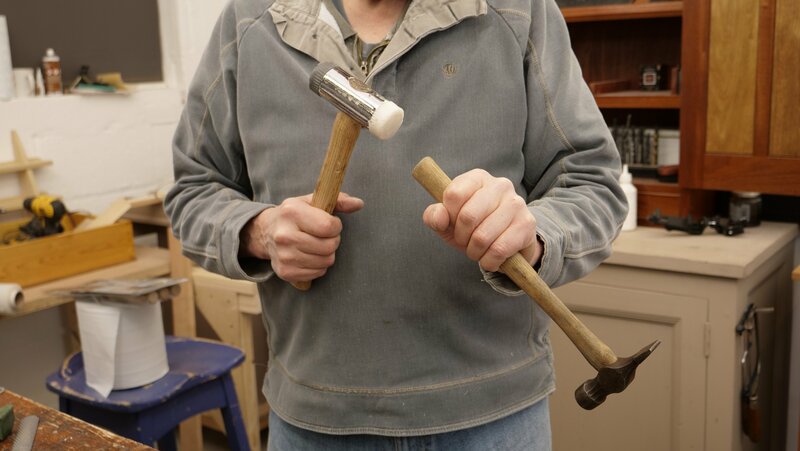 Paul recommends scraping off the varnish from the handle when you get a new wooden-handled hammer and he recommends adding 4 coats of boiled linseed oil over a few days. This finish will ensure the hammer handle keeps in great condition and lasts a long time. Boiled linseed oil can be a fire danger so read up on this and take care before using it. 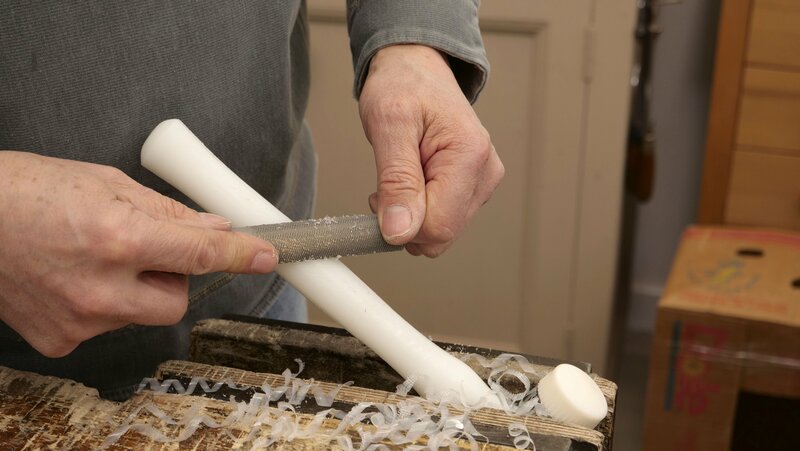 If the handle is nylon on your chisel hammer and you want to reshape it, a spokeshave will work nicely. 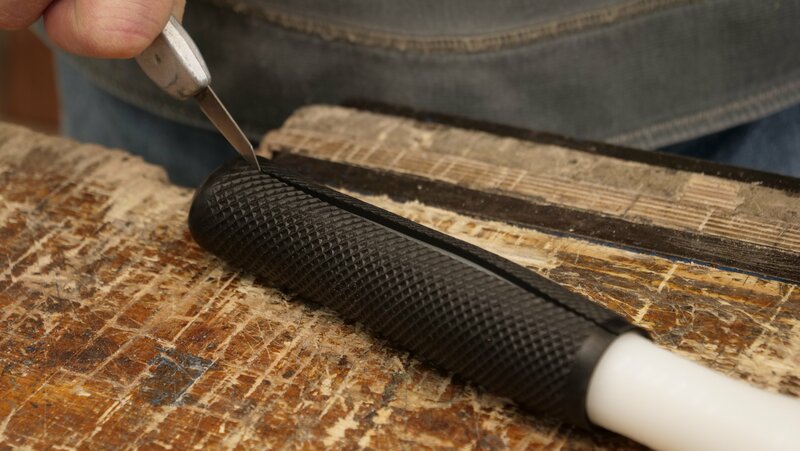 You can use sandpaper to add more grip and texture to the handle and the nylon face if it is slippy. You can add a few coats of coloured shellac for aesthetic purposes. Sometimes the hammer head can become loose, this could be because wood can shrink when the atmosphere changes from one level of humidity to another, or because the hammer has been misused or damaged. A hammer usually has two wedges, these can be steel or wooden, which spread the end of the shaft to widen it within the hammer head. Steel wedges have the advantage of not breaking over time, however they don’t hold or spread the fibres any better than the wooden wedges which you can readily make yourself. Before replacing the wedges, hold the hammer upside down and strike the end of the hammer shaft, the counter weight of the hammer head drives it further into the eye of the hammer head. You can also try driving existing wedges in further using a nail punch. Replace any missing wedges with new ones by first creating an entry slit and then driving in the wedge. This splits the wood, however it will not split beyond the constraints of the eye of the hammer head. If there is any excess wedge left, cut and file this down. Tip: If you are using wood to re-wedge a hammer, you can make the wedges from offcuts of most hardwoods to save money and materials. Cut off the rubber handle using a knife, this rubberised sleeving reduces sensitivity in use. 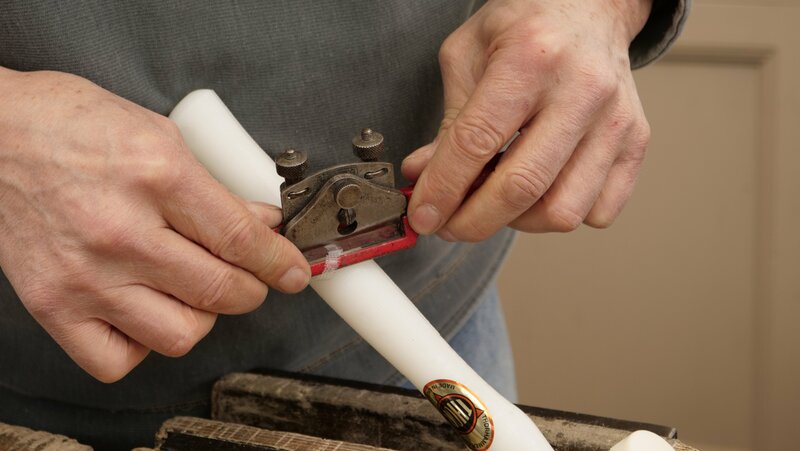 Using the Spokeshave, remove material to make the handle more comfortable. Keep checking the shape by holding or trying it in your hand. The rasp is good for removing lots of material but also for shaping, its rounded surface can be used to create curves and dips. It's also good for texturing prior to sanding. Strike the end of the hammer to drive the shaft into the eye further and make it more secure.